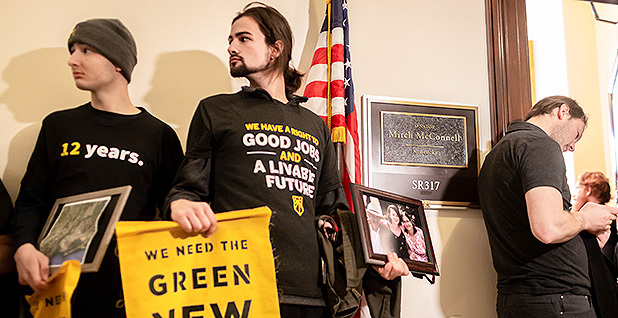 The Senate is set to take a procedural vote on the Green New Deal as soon as tomorrow, a widely anticipated event that will inevitably come with partisan fireworks. It will cap weeks of unusually intense debate about climate change on the Senate floor, and the long-term political fallout could help determine where policy on the issue ultimately lands in the coming years. The resolution has revitalized the climate debate. It's now rare to see a discussion of climate policy without mention of the Green New Deal. It's now also unusual for Democrats to discuss their agenda and not touch on global warming. The Green New Deal has made its way into the 2020 conversation, with at least a half-dozen Democratic presidential candidates signed on in support. But there are also fears on both sides that the Green New Deal either goes too far or isn't politically and technologically feasible to meet the immediate challenge of climate change. It was originally introduced by Rep. Alexandria Ocasio-Cortez (D-N.Y.) and Sen. Ed Markey (D-Mass.) and has a laundry list of co-sponsors, including more than a third of the House Democratic caucus. The text calls for a war-like economic mobilization to transition the country to clean energy, as well as parochial progressive goals, such as health care for all. Senate Majority Leader Mitch McConnell (R-Ky.) tried to capitalize on its ambitious scale by announcing the vote last month, in hopes the plan would divide Democrats and allow the GOP to label them as extreme. With that in mind, most Democrats plan to vote "present" on the resolution. One possible exception to that strategy is coal state Sen. Joe Manchin of West Virginia, who said earlier this month that there is "no such thing as a new green deal." "This is a little trap that Sen. McConnell has set here that Democrats are not going to fall into," Morgan Gray, Markey's legislative director, said at a panel discussion last week during the American Council on Renewable Energy's (ACORE) annual policy conference. "And I think what will become clear in the debate that we'll have next week is that Democrats are unified in wanting action on climate," he said, "and we still have yet to hear what the Republican plan on climate is." McConnell has initially said the Senate would vote on the resolution sometime before August, but he eventually filed for cloture earlier this month, setting up this week's vote. Since he announced the move in February, McConnell and Senate Minority Leader Chuck Schumer (D-N.Y.) have talked about climate change on the floor nearly every day the Senate has been in session. That came to a head during a firey floor debate on March 6 involving interruptions and partisan yelling. President Trump also blasted the Green New Deal in an interview with the Fox Business Network late last week, calling it "the most preposterous thing." Throughout the last several weeks, Democrats have tried to apply counterpressure by repeatedly asking McConnell and Republicans whether they believe in man-made climate change and whether Congress should address it. Democrats even introduced a separate resolution to that effect, co-sponsored by every member of their caucus and one lonely Republican — Maine Sen. Susan Collins (Greenwire, Feb. 28). That resolution is unlikely to ever see the floor, but the goal was to unite Democrats on the basics of climate change and point out that Republicans have largely ignored the issue for the last 10 years. "The key here is to keep Democrats together," Hawaiian Sen. Brian Schatz told reporters last month. "And we have accomplished something pretty important, which is that I now have six microphones asking me about climate change, where normally it's just a couple of you." The predictions of congressional observers about the fallout are mixed. Many conservatives, even those who believe Congress should act on climate, see the vote as a good move by McConnell to capitalize on a leftward shift on the Democratic side. "To me, what this has revealed is that while Republicans are late to the discussion about climate change and just beginning to assemble their policy proposal, there's also not a lot of really serious proposals from reasonable Democrats on climate right now," said Alex Flint, executive director of Alliance For Market Solutions, a conservative carbon tax group. Other observers, however, think the vote — and the climate debate that has preceded it — has simply exposed the fact that Republicans in general have ignored the issue and continue to resist real action. GOP leaders have in recent days pointed to legislation on carbon capture and nuclear power to buttress claims they have already considered climate a priority. Florida Republican Rep. Matt Gaetz, an outspoken ally of the president, is touting a Green Real Deal, Politico reported. Polls show that voters increasingly care about the issue with the rise of the Green New Deal and a string of ominous scientific studies. Democrats have a framework on the table, in addition to various climate bills introduced by individual members. "I predict: McConnell will regret it," Bill Snape, senior counsel at the Center for Biological Diversity and a vocal Green New Deal backer, said in an email. The political battle behind the Green New Deal is also causing some anxiety in the energy sector, even though the document would send a message, rather than immediately change policy. Renewable energy officials last week said that while they back the Green New Deal's goals, they're also concerned the ambitious plan could further stoke political tension over clean energy and climate change. Greg Wetstone, the president and CEO of ACORE, said during last week's conference that the resolution had created "a lot of buzz" about climate change that otherwise might not have happened. But referencing the resolution's call for universal health care, Wetstone noted the plan "also somehow put health care in the middle of our challenges, which one could argue were plenty complicated already." Sarah Webster, the vice president for investor and government relations and corporate communication for Pattern Energy Group Inc., said she was concerned by the plan's linkage of clean energy to a broader political agenda. "It has brought climate into the presidential discussion in a way that is essential. I'm very grateful for that," she said during a panel discussion at the ACORE event. "But I'm also concerned that it is a message bill, it's not something that is a formal proposal, it's not a road map to change in our society, the deep systemwide decarbonization, which runs the risk and already has alienated people on the other side of the aisle because of the politics around it."